The case studies below show the successful application of Banixx for cats. Frequently, products developed for dogs are not suitable for cats. Not so Banixx – it is safe for cats. 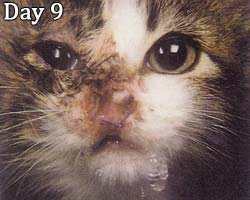 Banixx has been used successfully on a 12-week-old kitten with severe facial trauma. Also, visit the Cat FAQs. Although the outcome is fantastic, some of these photos may not be suitable for sensitive viewers. Cat ear infections may cause serious health issues and may reach an advanced state before symptoms become noticeable. 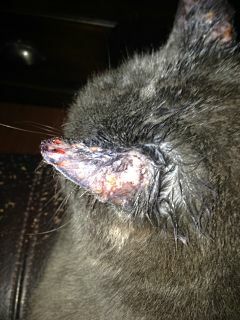 If you suspect your cat may have an ear infection, do not hesitate to contact your veterinarian immediately. Rescued from the side of the road, this 12–week old kitten had apparently been tossed out of a car window. 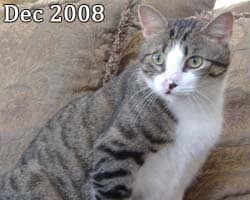 The cat had lost part of his nose and sinus, had severe abrasions and open wounds. 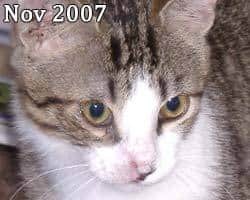 Due to the cat’s age, the severity of his injuries and skin wound infection, only loose stitches could initially be applied. 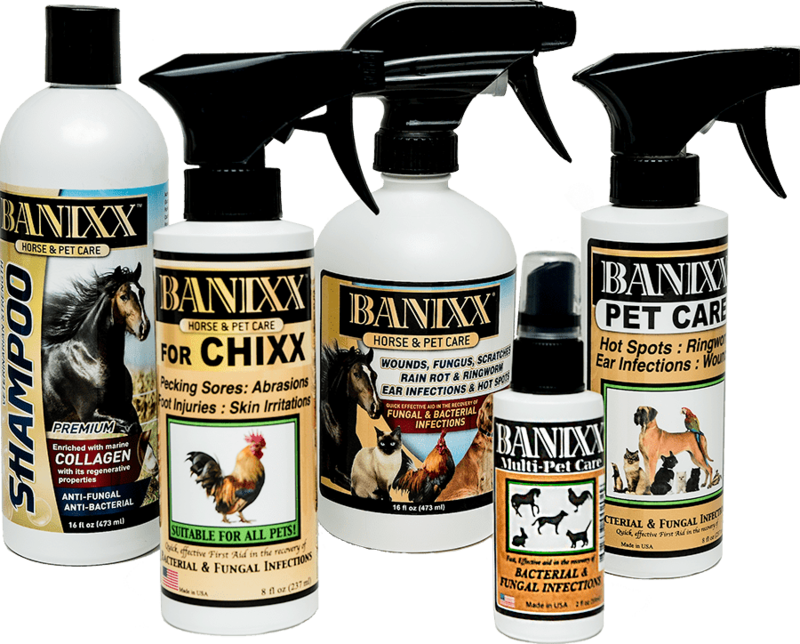 Banixx was used to successfully flush the cat’s wound debris and infection. 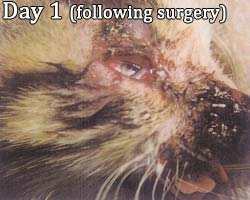 The stitches did not hold, so the treatment of choice was to drip Banixx onto the cat’s face twice daily using a small eye dropper. 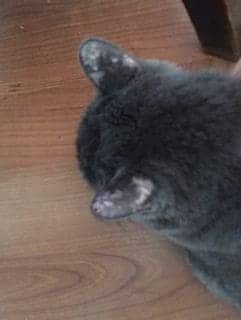 The cat recovered, as you see in the pictures, and obtained a loving home through the treating veterinarian, Dr. Broadhurst of Pinehurst, NC, and The Moore Humane Society. 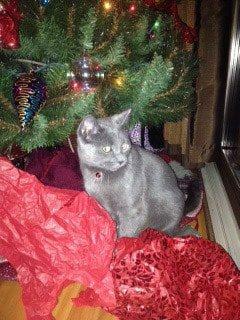 Meet Mr. Ringworm, our grey cat here! 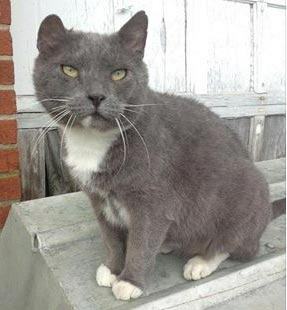 He was so named because he had been plagued by cat ringworm for years, losing much of his hair and his good looks! His caretaker then found Banixx for cats! After successfully treating Mr. Ringworm’s infected skin with Banixx, he is clear of ringworm and, now, he is just called… Mr. R.
Ringworm in cats/kittens is very contagious, so be sure to use precautions when treating (wear disposable gloves, sanitize all bedding and cat living areas). Click Here to Find Out Where to Buy Banixx! Diego had gotten himself into a cat fight, while I was traveling. The caretakers did not notice the cat’s skin infection. 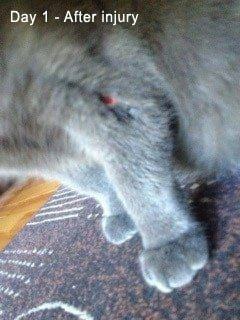 Friday, the first day after the cat fight injuries, the wound was noticed on Diego (photo top, left). 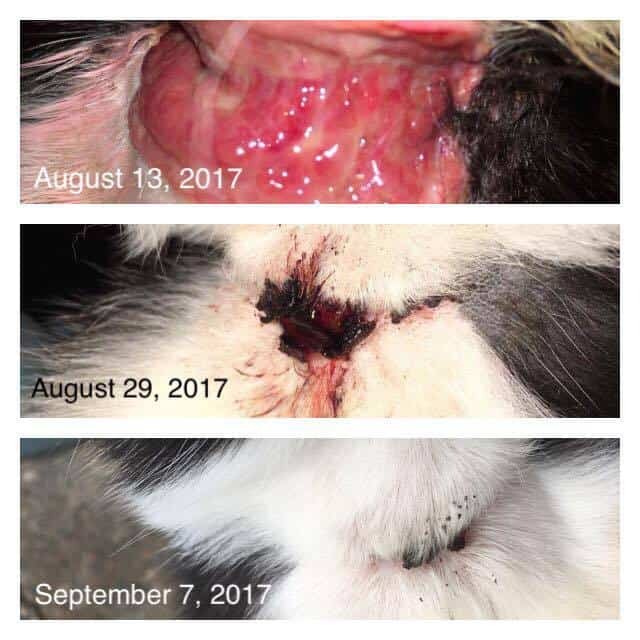 Thank goodness for Banixx, it showed amazing healing in only two days (middle photo). Healthy and Naughty Diego is now ready for Christmas mischief (photo above, right)! 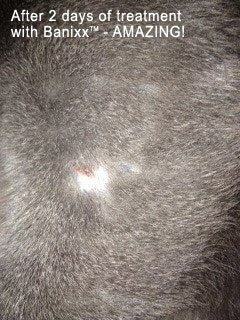 If you notice, the upper thigh where Diego had the very severe and infected wound, it has even re-grown hair. You can no longer see the scar.